What Are You Willing To Do To Get That Job? Meet Abiola Aborishade. Abiola’s dream is to play professional football for the New England Patriots. 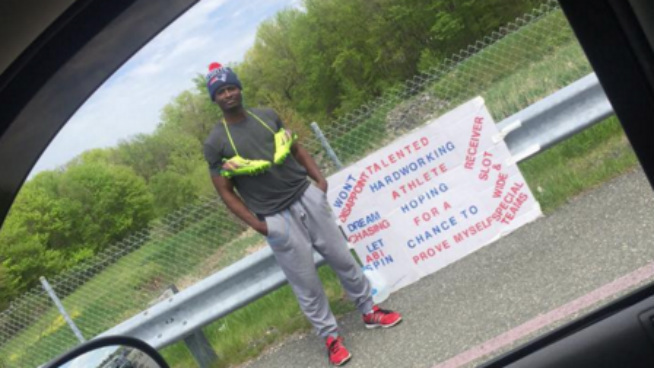 At the time of writing this article, Mr. Aborishade has waited outside of Gillette Stadium for a month, with the hopes of landing his dream job. Aborishade’s statement echoes the sentiment I share in “Hopeful to Hired”. In today’s competitive job market, you’ve got to set yourself apart from the rest. If you want to be noticed by employers, you have to get their attention. And if you wait until you’ve graduated from college to start standing out, you’ll be way behind the curve. According to 247Sports, thus far, Aborishade’s logged 130 hours of canvasing for a tryout. What if you put in 130 hours of effort, while in college, to build the type of personal brand that makes you a top job draft pick upon graduation? Imagine what a 130 hours of effort could do you for building your professional network and industry reputation. If this article resonates with you. If you’re thinking to yourself, “I really need to get the ball rolling on getting personal brand in to shape”, I highly recommend you order, “Hopeful to Hired”. I promise that it will provide you the insights and strategy you’ll need to be successful post graduation.